We are offering Incense Stick Packing Machine to our clients. 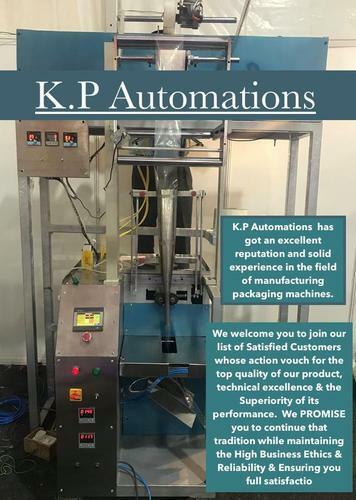 K.P Automations has got an excellent reputation and solid experience in the field of manufacturing ,packaging machines. Today, we are a globally reputed organisation with a wide client network that is spread all over the world.K.P. AUTOMATIONS has also marked its presence in various sectors like Food Processing , R&D, Packaging , engineering ,fully plant automations. We welcome you to join our list of Satisfied Customers whose action vouch for the top quality of our product, technical excellence & the Superiority of its performance. We PROMISE you to continue that tradition while maintaining the High Business Ethics & Reliability & Ensuring you full satisfaction. No. of sticks 5 to 20 sticks/pouch. Starting with a simple beginning in year 1998,Today K.P. AUTOMATIONS has also marked its Presence in Various Sectors like Food Processing , R&D, Packaging , engineering ,fully plant automations .Our machines are Design to suit the Dynamic working of Varied Industries to Maintain High Standard of Quality.The Company is headed by a team having 18 years of experience in the fields of Design, Development, Manufacturing & electronics and mechanical integrated systems in Packaging sectors. KP group emphasises on giving complete support to our customers, from consultation and Development of the machine as per client requirements, to production of the Packaging machines and providing extensive after sales service. We are dedicated to providing the highest production rates, maximum accuracy and consistent pouch quality as per each individual client’s requirements. innovation and expertise, from the handling of raw materials to the packaged product. Our mission is to satisfy Customers requirements with an integrated approach as project partner.Each project is carried out according to a specific engineering analysis of the production requirements and involving the Customer, step by step, from the design to the installation.